Enjoy all the flavor of buffalo chicken wings without the mess or calories with our Frank’s Buffalo Chicken Dip! Creamy, spicy and a huge crowd pleaser! 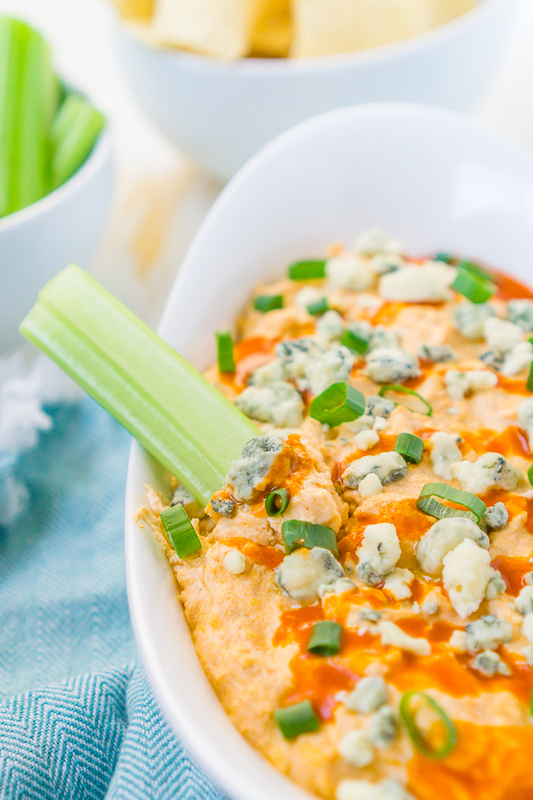 Your friends and family will thank you for this slow cooker buffalo chicken dip! An Easy Buffalo Chicken Dip Recipe that can be made in the slow cooker or oven! I am a HUGE fan of buffalo recipes! While I did not grow up in a household with spicy recipes at all, you will always find a big bottle of Frank’s RedHot Buffalo sauce in our fridge. Our favorite food with buffalo sauce though is Buffalo Chicken Wings, of course, but those are not the healthiest or cleanest of foods. Thus I created this Skinny Buffalo Chicken Dip! In order to make it “skinny” compared to other recipes for buffalo chicken dip, I used low fat cream cheese, non-fat Greek yogurt (which you could substitute for low fat sour cream if you are in a bind), and reduced fat cheese. Don’t worry though; it still has a lot of flavor. How could it not with Frank’s Buffalo Sauce! We went through a few different versions of our slow cooker buffalo chicken dip before feeling like we had the perfect ratios. Most dip recipes we read were just too light on the buffalo sauce so we included a whole cup! It really increases the flavor while keeping it enjoyable for everyone, because we definitely have friends and family who don’t love a ton of heat. So coming in close second to them are our twists on the classic wings such as our Buffalo Chicken Flatbread, Buffalo Chicken Meatballs and this recipe for skinny Buffalo Chicken Dip! We almost always make this warm chip dip recipe in our slow cooker because we like that we can put it on warm after it’s initial cooking time, keeping it warm throughout the entire game or party. You will simply add all the ingredients to the slow cooker, let the dip cook on low for 3 hours, and enjoy when ready! If you don’t want to make it in the slow cooker, you could heat up the dip on the stove top or in the oven. See instructions below for oven instructions. If you prefer to cook this Frank’s Buffalo Chicken Dip recipe in the oven instead, you can! You will just mix up all the ingredients and transfer to an oven safe baking dish to cook at 350 degrees F for 20 minutes. I recommend adding a little extra cheese on top for this cooking method for a nice golden cheese topping. 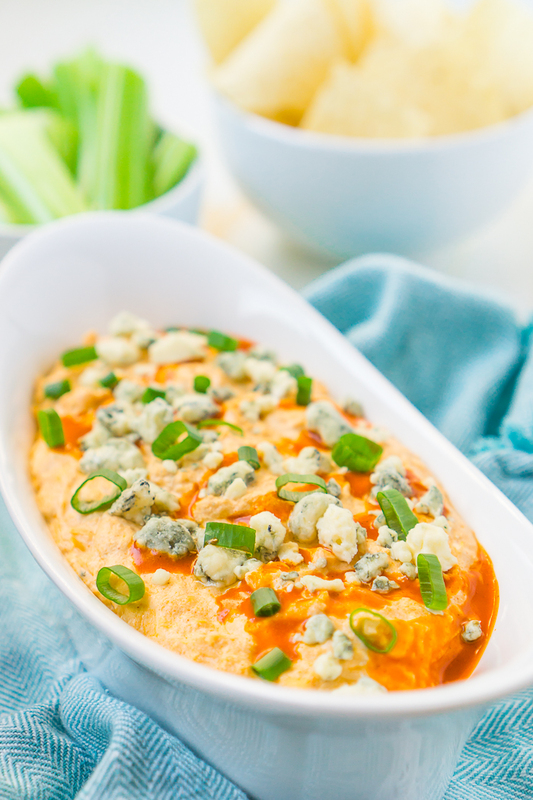 There are a ton of options for dippers for this easy buffalo chicken dip! CAN I MAKE BUFFALO CHICKEN DIP WITH CANNED CHICKEN? Now, a quick note about the chicken. My preference is to use fresh shredded or chopped cooked chicken. For something like this, I like cooking fresh chicken breasts in chicken broth in the slow cooker for around 6 hours with a little garlic powder, salt, and pepper. I’ll usually make a big batch of chicken when I make my slow cooker Chicken Tortilla Soup so that I can it for this dip, my flatbreads, or Chicken Caesar Pitas. I don’t always have time to make shredded cooked chicken! So a simple answer is that yes, you can also make this buffalo chicken dip with canned chicken! It is a super fast and easy option, especially if you don’t have time to prep chicken, and the dip will still have a ton of flavor! I promise! However, canned chicken is never my first choice! Fresh chicken is always more flavorful. Franks Buffalo Sauce is always my go-to choice for buffalo sauce! If you have a different buffalo sauce that you prefer, you should use that. If you want to make this Skinny Buffalo Chicken Dip in the small cooker, then this Small Slow Cooker is perfect for apps and dips or you can use a regular size like this one which is my favorite – Set and Forget Slow Cooker. Small Slow Cooker Liners will make your clean up way easier. Plus you will need great serve ware! Consider a Chip and Dip Bowl and White Appetizer Plates that are perfect for any occasion! Time to Quickly Stir Together Frank’s Buffalo Chicken Dip! A tasty (and healthier) twist on classic Buffalo Chicken Wings! 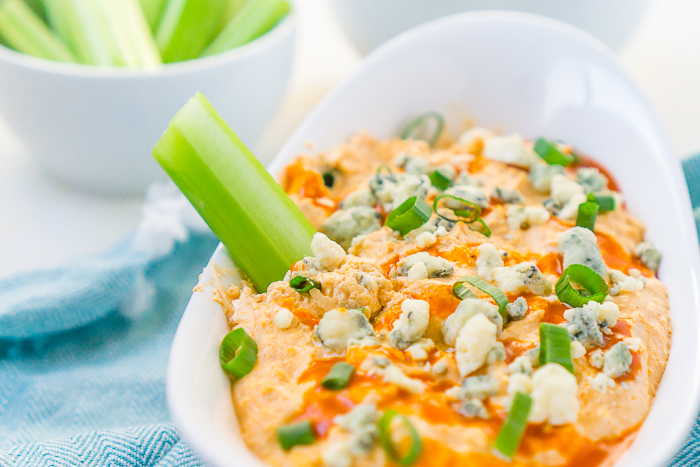 Quickly mix together this easy Buffalo Chicken Dip for a chip dip you're guests will love! Serve with celery, tortilla chips, bread, carrots, and more! Stir all ingredients together in a slow cooker until combined. Heat on low for 3 hours or until the cheese is melted; you can then switch to warm. Heat on high for 1 hour if you need quick prep but then set heat to low for remaining time to prevent the dip from burning. Serve immediately. Add all ingredients to a medium bowl and stir until well combine. Place combined dip into shallow 1-quart baking dish. Bake at 350 degrees F for 20 minutes or until mixture is heated through. Stir and garnish with optional chopped green onions or blue cheese crumbles if desired. Enjoy!